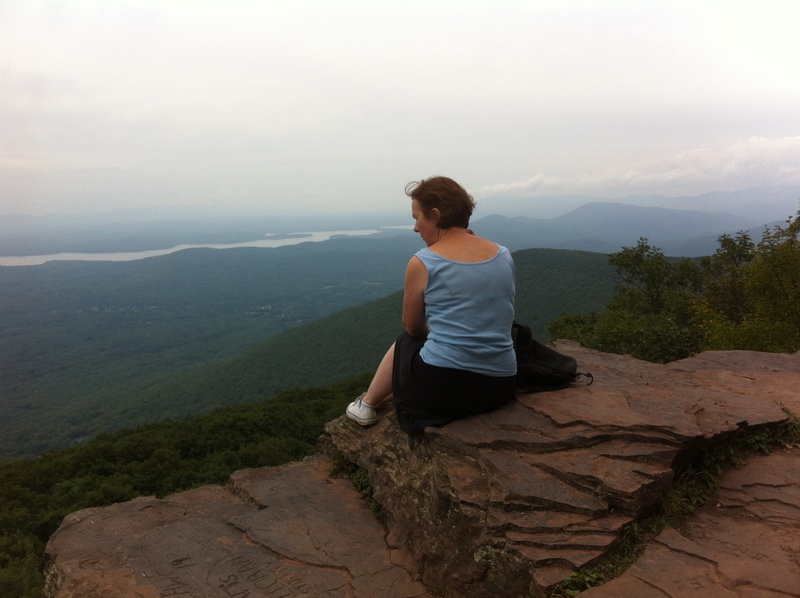 You have to work hard to reach the finest view of New York’s Hudson Valley. The trailhead to the aptly named Overlook Mountain can be found just outside Woodstock, opposite a Buddhist Temple and you soon find yourself praying for good karma on the hike up. It is a rocky and relentless two-and-a-half mile climb, with barely a flat section until near the top, when you reach the spooky, eerie husk of a once-glamorous hotel. Its roofless hallways and public spaces are now full of trees and creepers and (a warning sign suggests) timber rattlesnakes. Take it as a waymarker that the end is nigh and move on, rather than explore its unstable interior. At the summit of the trail is a small sign pointing through the undergrowth. “Scenic Outlook”, it says, and you damn well hope so after that climb, where you have mainly been looking at a solid wall of trees on either side. 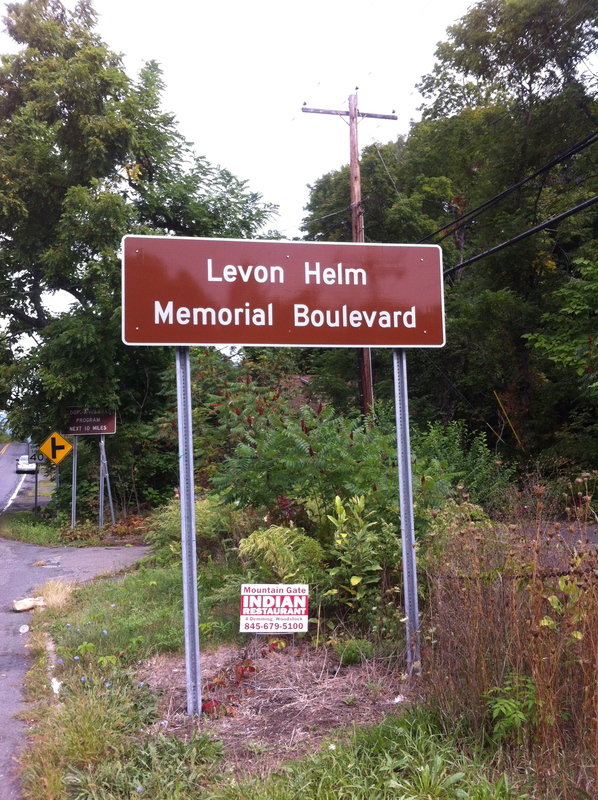 You struggle through the brushwood until you find yourself on a rocky outcrop, with the valley spread out below you, the wide, silvery ribbon of the Hudson itself on the left, the glistening waters of the Ashokan reservoir on the right and what feels like the whole world at your feet. It is both sudden and breathtaking and I can’t recall such a sneaky reveal of a fabulous view outside of the Grand Canyon. 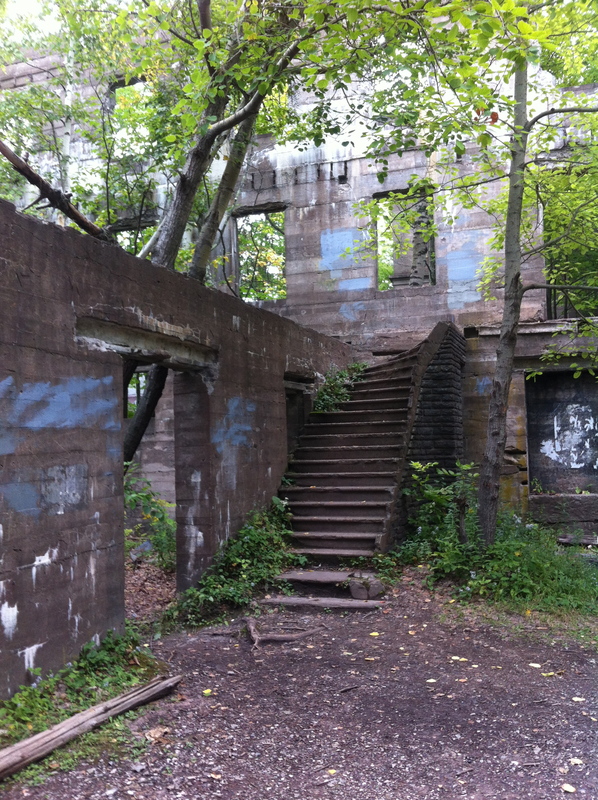 You can gild this particular scenic lily by taking the steel staircase (if it is open – it’s manned by volunteers and usually weekend-only) to the restored firetower, which adds in a portion of the Catskill mountains to the north, humped like a series of green-backed cetaceans. I asked my wife if she thought the view was worth the long hike and the rickety steps up to the tiny cabin of the tower. “It’s worth the plane ticket over,” she replied. It was an opinion she was to revise on the return leg. The walk down was not that much easier than the ascent, but we were elated at having made it to the top on a hot, enervatingly muggy day. We were talking loudly and joking about rattlesnakes when two hikers who had halted some way ahead waved for us to stop. We did so. The man drew a finger across his throat. I instantly thought of Cabin In The Woods or any other number of city-folk-in-the-wilderness movies. And so it was, a handsome black bear, inspecting the ferns, shrubs and trees that lined the side of the road about twenty metres to our right. Not a huge bear maybe, but when it reared up against a tree trunk, large enough to make knees knock. Every now and then it glanced our way or at the other hikers. It gave a few desultory sniffs of the air. It was a fine time to remember the half-eaten sandwich in my backpack. ‘Which one do you do for a black bear?” she asked. “I don’t remember,” I replied. Quietly, so as not to disturb our new ursine chum, she gave me a dead arm. 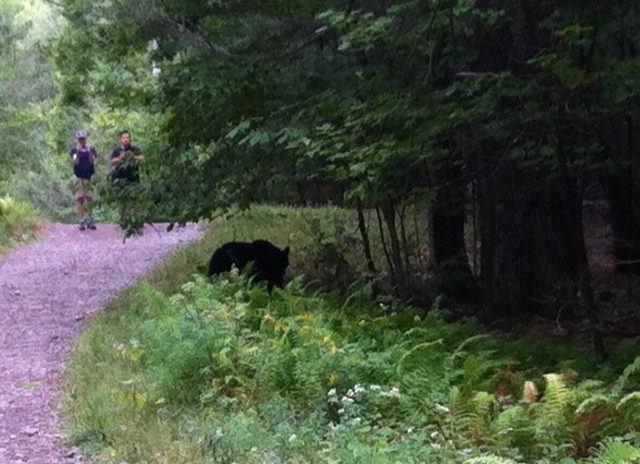 All I could really recall was that a black bear can run at 35mph. A rough calculation suggested this was about 30 mph that I could manage uphill, even with a bear on my tail. We were stuck on that path for the time being. I subsequently discovered that there are at least 8,000 black bears in New York State. The population is growing and interactions with humans are increasing. So this year the autumn hunting season was extended into what amounts to a cull. Until the end of September, hunters were allowed to kill bears with “bow, crossbow, muzzle-loader, shotgun or rifle” in areas designated by the Department of Environmental Conservation. But I didn’t have any of those particular weapons on me and, besides, the innocent bear was mostly minding its own business. Mostly. Every now and then it would wander onto the track then, as if catching an elusive fragrance, it would be drawn back to a particular tree and start inhaling and snorting loudly. We were standing there for close to twenty minutes, waiting for this tree-junkie of a bear to get bored. Eventually, it looked up into the branches of its favourite trunk and, with an ease I still can’t quite comprehend and a speed that was both impressive and terrifying, it began to climb. With the crack of claw on bark and the odd grunt, it was soon in the upper branches, swaying like an overgrown, swarthy koala. ‘Not the climb-a-tree-to-escape species, then,’ I offered to my wife, whose expression suggested she thought my zoology degree was a waste of three years. It was time to go. We set off using a speedy gait that was a combination of Olympic race-walking and Lee Evans at his most hyperactive. We warned those coming from the car park that there was a bear in the air. Several, who had encountered bears before, turned back. Others, including a pair with what looked to me like a tasty morsel of a dog, carried on regardless. I travelled as a guest of Virgin Holidays (0844-573 0088, virginholidays.co.uk), which has a week’s fly-drive to New York from £929pp, including flights and Alamo car hire. Advice on what to do when you encounter a bear can be found on nps.gov/subjects/bears/safety.htm. The best course of action is to back away slowly. Attacks are rare. If you are attacked, with brown and grizzly bears, you play dead. With black bears, you shout and make yourself seem as large as possible. Don’t climb a tree. This entry was posted in Uncategorized and tagged New York, Travel on October 8, 2015 by Robert Ryan.